With the push towards subscription services such as Office 365 and Microsoft 365, the people who still want to purchase a stand-alone copy of Microsoft Office can sometimes feel left out, and that the product they’ve spent a lot of money on is difficult to download, install, and activate. This certainly applies to people who purchase a product key for Office 2016 or 2019. These product keys are available from multiple sources from computer fairs, to Amazon, Groupon, and many other websites worldwide. Fortunately, Microsoft have made it easy to download, install, and activate the correct copy of Office. In a web browser on the PC where you want to install Office visit the website www.office.com/setup. Here you will be prompted to sign in with your Microsoft Account, and enter the product key you have purchased, and you will then be presented with an installer for the correct version (you will be offered the choice between the 32-bit and 64-bit versions of Office) which you can download and install. 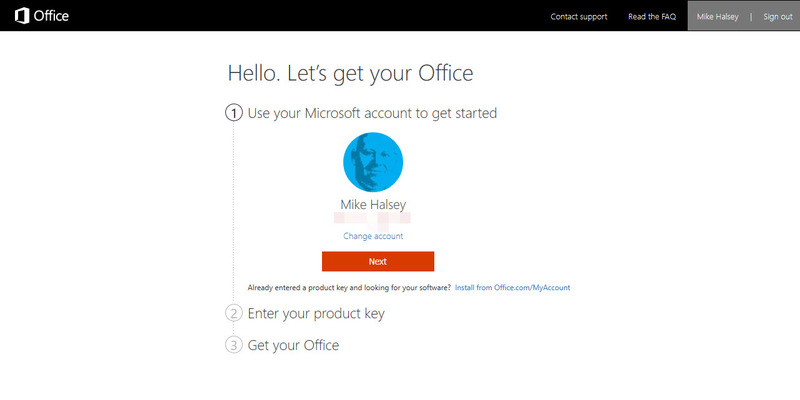 Should you need to reinstall Office in the future the product key will be linked with your Microsoft Account. This means all you need to do is visit the Office My Account page on the Internet, sign in, and click the Install Office button to launch the live installer.